For three decades, investigative biographer Kitty Kelley has made her mark by writing penetrating examinations of living cultural icons, without their cooperation and independent of their control. In Oprah: A Biography she tackles her most fascinating and formidable subject yet, delivering a comprehensive, rigorously researched, and compulsively readable portrait of a unique American personage who transcends celebrity and who has left an indelible imprint on our society, even as she has sought to change it. A closely observed, exhaustively researched, balanced, and psychologically insightful portrait of one of the most fascinating, powerful, and influential public figures or our time, Oprah will be a must-read for anyone who seeks a greater understanding of Oprah’s extraordinary life and career and of her important place in American cultural history. Oprah debuted at number one on the New York Times best seller list. NOTE: The paperback edition of Oprah contains new material interspersed throughout the text in bold typeface. Some of this new material is from Oprah’s cousin, Jo Baldwin. 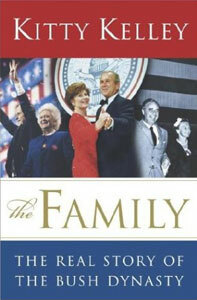 The Family is the first comprehensive inside look at the most powerful–and secretive–family in the world and according to the Irish Independent, “is her most controversial, and potentially most important book to date.” Though the Bush Dynasty has wielded enormous power and influence for more than half a century, it has created an obsessively protected public image. Kelley probes behind this guarded image and reveals shocking, penetrating and very human details about the lives of the Bushes, their antecedents, and their present-day family members. An important polemic on wealth, power and class in America, The Family is rich in texture, probing in its psychological insight, revealing in its political and financial detail and stunning in the patterns that emerge and expose the Bush dynasty as it has never before been exposed. “A fascinating read…an extraordinary read…great history and a great story told,” said Lou Dobbs. From Senator Prescott Bush’s alcoholism, to his son George Herbert Walker Bush’s infidelities, to George Walker Bush’s religious conversion, shady financial deals, and military manipulations, Kelley captures a portrait of a family that has whitewashed its own story almost out of existence. The Family debuted at number one on the New York Times best seller list. The Royals, unveils the best-kept secrets behind Britain’s royal family, the Windsors. Based on years of research and hundreds of interviews with palace insiders, Kelley offers an uncensored history so revealing that it was not published in Britain – “A smorgasbord of scandalous tidbits … warts-and-all biography,” reported People magazine. Giving “a rarefied look inside the world of aristocracy” according to the Philadelphia Inquirer, Kelley exposes the questions around one queen’s parentage and another’s conception, the well-hidden royal affairs, the real reasons for the tumultuous relationship between the Queen Mum and Diana, Princess of Wales and the behind the scenes accounts of the royal marriages. 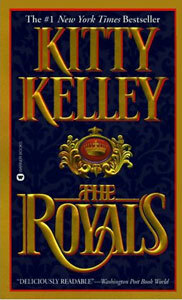 The Royals debuted at number one on the New York Times best seller list and, according to Publishers Weekly, became the fourth bestselling non-fiction book in America for the year. UPDATE, 2010: Reissued as trade paperback, ISBN 978-0446585149, with new material. Also available as ebook. Through more than 1,000 interviews collected during four years of exhaustive research and reporting, Kelley reveals Nancy Reagan as a superb public performer; a vain, materialistic social climber; a bitter foe and formidable strategist. Foremost, Nancy Reagan was an American phenomenon that created the two most spectacular careers in politics of the time—her husband’s and her own. 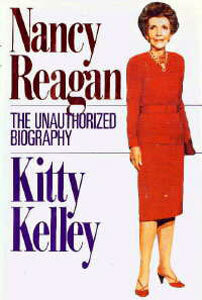 “Some want to read it because they like her (Nancy Reagan) and some want to read it because they didn’t like her,” reported the Sarasota Herald-Tribune in its 1991 review, though not everyone was as eager to see Kelley’s book. According to the Herald-Tribune, Barbara Bush later advocated to remove it and Kelley’s book on Jacqueline Kennedy Onassis from a Smithsonian’s first ladies exhibit. Nancy Reagan: The Unauthorized Biography was number one on the New York Times best seller list, selling 1 million copies in hardback. It became the fastest selling biography in publishing history. UPDATE, 2011: Reissued as ebook. His Way is an unauthorized biography of one of the most elusive cultural icons in modern America. The book was called “the most eye-opening celebrity biography of our time” by William Safire of the New York Times. Kelley spent three years researching government documents (Mafia-related material, wiretaps and secret testimony) and interviewing more than 800 people in Sinatra’s life (family, colleagues, law-enforcement officers, personal friends). Exposing details on his marriages, numerous affairs, involvement with the mafia and much more, His Way is a rollicking, relentless and revealing detailing of a man who defined more than five decades of American music, style and entertainment. 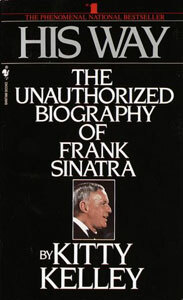 The book, however, did face an uphill battle in detailing such a powerful figure, with Sinatra himself filing a lawsuit before it was even published. As William Safire put it in his 1983 New York Times article, “He presumes to use the courts to intimidate the chroniclers of his life; in so doing, he displays the embittered arrogance of a man obsessed.” Sinatra later dropped his lawsuit against Kelley. His Way was number one on the New York Times best seller list, selling 1 million copies in hardback. The book set records in the U.S., England, Canada and Australia as the biggest selling biography in publishing history. UPDATE, 2010: Reissued as trade paperback, ISBN 978-0553386189, with new material. Also available as ebook. UPDATE, 2015: The 2010 edition was reissued for Frank Sinatra’s centennial with a new Afterword. 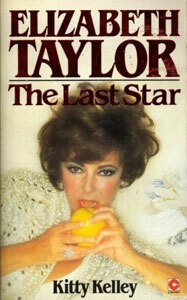 While Elizabeth Taylor lived her life in the spotlight, Kelley is able to offer a full, exhaustively researched and detailed portrait of one of Hollywood’s most intriguing figures, with the details of her life gathering an “awesome momentum as they pile one on top of the other,” according to a review in The New York Times. Kelley’s thorough and honest portrayal of Elizabeth Taylor presents a likable star, while impartially chronicling her lavish lifestyle and numerous marriages and relationships. “‘I didn’t write a book about Mother Teresa of Calcutta. I wrote a book about one of the world’s most controversial women who has been married seven times, who has had huge ups and downs, who has lived her life right out there in the public. I think I’ve been fair. But compared to the other Liz Taylor bios, all that one-sided movie magazine swill, it’s like ‘Helter Skelter’ vs. Bo Peep,” explained Kelley in a 1981 interview with Knight News Service. The Last Star was a New York Times best seller. UPDATE, 2011: Reissued as ebook with new material. Also available as trade paperback, ISBN 978-1451656763. 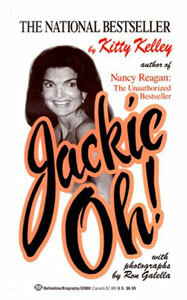 Jackie Oh! is the inside look at America’s own American princess who continued to fascinate Americans with her private life, long after her public role as First Lady was tragically ended. The book offers numerous behind-the-scenes details of the Kennedy world, revealing John F. Kennedy’s womanizing ways and offering compelling details on Jackie’s journey from debutante to Senate wife, First Lady and First Widow. Tragic, heroic, private: the image of Jacqueline Kennedy Onassis remains the image of an American icon that will never lose its ability to charm and fascinate. Jackie Oh! was a New York Times best seller. Update, 2012: Reissued as Kindle ebook.